I have been inspired by several awesome blog series lately... Kids' Clothes Belgian Style by StraightGrain, Vintage May by Craftiness is not Optional and Skirt as Top and Knock if Off by Elegance and Elephants to name a few. I was thinking how cool it would be to host a series myself. The problem was, I had to come up with something original, fun and appealing to the bloggers I love. I woke up one morning about six weeks ago and the idea for When we were young came to me. I wasted no time...that evening I put together the blog button (from my favourite children's book which you can read more about here) and sent out an email to a bunch of my favourite bloggers. I went off to sleep that night thinking..."I wonder if anyone will reply...". I switched on my phone to find half of the people I had contacted had replied right away with an excited yes!!! Yippee!! Anyway, what is this series all about? My Mum sewed for all of us (six) kids and I have fond memories of many of the outfits I wore as a young girl. When we were young will feature a blogger each week who will (in most cases) offer us a glimpse (by way of photograph of themselves as a child) of one of their favourite childhood outfits. This is not one of my favourite outfits...but that was certainly my favourite toy...me on my fourth birthday. June 12: Jess from Craftiness is not Optional - see Jess' creation here. June 19: Sanae from Sanae Ishida - see Sanae's creation here. June 26: Venus from Suburbia Soup - see Venus' creation here. July 3: Trine from Groovybaby....and Mama - see Trine's creation here. July 10: Gail from Probably Actually - see Gail's creation here. July 17: Ana Sofia from S is for Sewing - see Ana Sofia's creation here. July 24: Cherie from You and Mie - see Cherie's creation here. July 31: Ros from Sew Delicious - see Ros' creation here. August 7: Sarah from EmmyLouBeeDoo - see Sarah's creation here. August 14: An from Straight-Grain - see An's creation here. August 21: Marta from DoGuincho - see Marta's creation here. August 28: Kristin from Skirt as Top - see Kristin's creation here. September 5: Me!! - see my creation here. Awesome, no?? In the words of my three year old, Juliette, "I am so ascited!!" If you feel inspired to sew something up from when you were young...please add it to the When we were young flickr group.. I will do a round up at the end of the series. Anyway, I hope to see you all back here next week to feature my first guest, one of my all time favourite bloggers - Jess from Craftiness is not Optional!! yay! this is such a fun idea!! what an adorable picture of you! I love this idea just to see the old pictures. But of course I want to see the outfits recreated too. Fantastic idea. 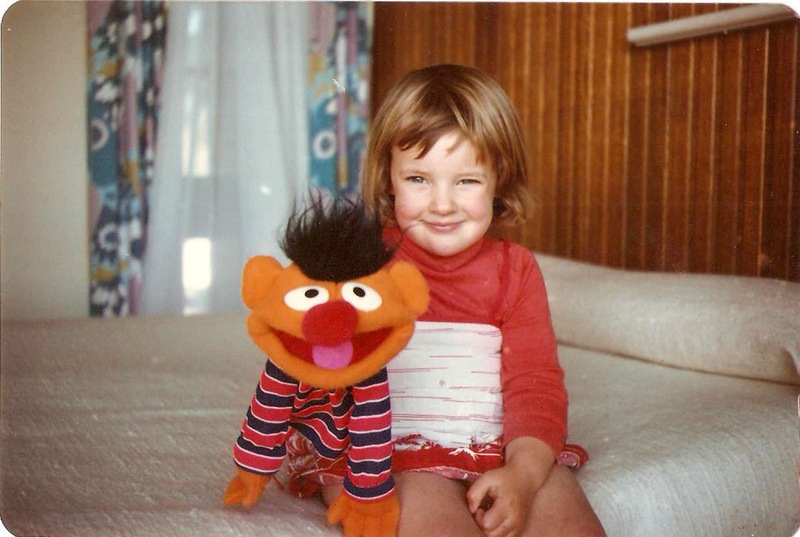 I loved Sesame Street as a kid too. Looking forward to seeing what everyone comes up with. Yay I am acsited too!! Oh my gosh - I thought that picture was Isabelle! Fabulous idea, Suz!!! I've just had a look through OLD photos and there's a few I'd like to recreate... not for my adult daughter, though... LOL!!! Super excited, Suz!! Such a great idea - my mom sent over so many pictures I'm having a hard time deciding!! Way excited! Since my post is so far away I might make two outfits...hehe. Such a great series idea. Woohoo! Can't wait for this to get started. Looks so fun!! Will have to see if I can sew along. My mum sewed a lot for all of us girls when we were little. Looking forward to seeing what your contributors come up with! Suz, congrats on your first series! Look forward to watching it, so exciting! Hi there! I'm already a big fan and I've been on the site about 4 seconds, ha. Can't wait for this series to begin, what a great idea! I can't wait for this series to start! I absolutely love the idea and I'm thrilled to be a participant! Thank you Suz! What a wonderfully creative idea for a series! I love it! I just might have to dig out some pics of myself and sew-along!